Roadworks, road closures and congestion can cause delays and lead to longer journey times. Circumventing bottlenecks is therefore key in ensuring optimised route calculation and scheduling. Two types of traffic information should be considered in routing: historical and live traffic. Historical traffic information, also known as traffic patterns, represent traffic flows as static speed profiles for specific road networks. To give one example: A road has a speed limit of 80 km/h. However, the actual average speed driven on this road on weekdays between 5 and 7 pm is 30 km/h. Since the delay occurs regularly - at the same time of any weekday – it is referred to as a traffic pattern. By factoring traffic patterns into route calculation, detours can be planned beforehand to minimise the need for spontaneous replanning. Live traffic data, on the other hand, delivers information on traffic incidents, road closures and delays that occur unexpectedly. Including live traffic information into route calculation minimises delays in journey times. Why should you use the Traffic Information API by PTV xServer? The PTV xServer Traffic Information API is a software developer component, available as a cloud-based web service or an on-premise solution. Due to its standardised interface, the component can be easily integrated into an existing software architecture. It considers both live traffic and traffic patterns: Live traffic information is visualised on customised digital maps. Traffic patterns are visualised as hydrographs showing the rate of flow versus time of the day. This enables you to gain quick insight into traffic patterns, and based on this knowledge, plan detours before bottlenecks occur. A detour around a bottleneck is not possible or would not make sense? 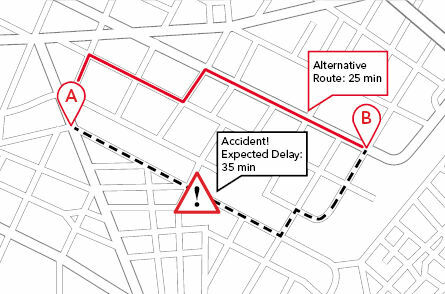 Then, the expected delay is factored into your route plan and the estimated time of arrival is revised. Historic traffic information, also known as traffic patterns, represents driven speeds on road segments in the past. The live traffic information includes current road restrictions and incidents as well as planned road maintenance and closures in the future. The PTV Content Update Service (CUS) automatically downloads additional data like live traffic information, manages the data status and deletes obsolete data. You can choose both the update method and update frequency. Configure the visualisation of traffic information on personalised maps based on your requirements and taste. You would like to start working with the API immediately without making any modifications? No problem. We offer standardised map profiles that are carefully designed to fit most standard use cases as an out-of-the-box-feature.